WOMAN MOTORIST is the first free automotive, car and motorsports magazine on the Internet for Women. We provide accurate, informative and fun articles on every subject from automotive safety, maintenance, car shopping, racing, advocacy and travel to information about automotive manufacturers' participation in our communities. We invite you to join us in the evolution of WOMAN MOTORIST. Send us email or letters, call or fax us with questions, suggestions for articles, problems with cars or your vendors, even your stories, thoughts and feelings about your vehicle, good or bad. We are all Women's primary source for information about their cars, travel and motorsports. WOMAN MOTORIST received over 104,000 visitors in the month of December. We are looking for contributors. Please read about our opportunities. WOMAN MOTORIST won some wonderful awards in 1996, especially those from several print magazines. They include the prestigious 4 Star Award from NetGuide and the Nettie from PC Computing. 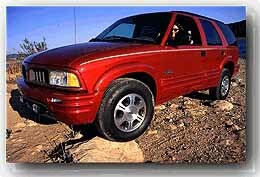 COVER PHOTO: WOMAN MOTORIST goes off-road with the flashy Oldsmobile Bravada. Coverage of the GREATER LOS ANGELES AUTO SHOW and the NORTH AMERICAN INTERNATIONAL AUTO SHOW in Detroit, MI. Can't attend an Auto Show? Read all about the new car introductions and see photos of the vehicles whenever you please. View the first ever cybercast/TV simulcast of a new car rollout from an auto show. WOMAN MOTORIST covered the Oldsmobile 1997 Cutlass debut live from the Chicago Auto Show. It was a historic, entertaining and informative event. And, a wonderful Women's oriented product. A letter from our editor, Sandra Kinsler. To the MMSI Home Page. Copyright 1996 WOMAN MOTORIST. All rights reserved. This WWWomen WebRing site is owned by [email protected].